Even if you have a killer gaming PC with the best possible graphics card and top-end processor, your gaming monitor shouldn’t be something you neglect. If you do, you’re letting a lot of that precious GPU horsepower go to waste. Here at That VideoGame Blog, we believe a good gaming monitor is just as important to a smooth gaming experience as your GPU. You could almost say they go hand in hand (because really, they do), and it is with that goal in mind that we set out to find the best gaming monitor available. To start, we placed a heavy emphasis on gaming scenarios. Everyone’s got a unique preference, and some gamers might prioritize a high resolution output over a great refresh rate, or vice versa. Some of that boils down to the types of games you like to play. Some might even prefer to play on a TV rather than on a monitor. Then, we looked at the obvious key important factors, such as: resolution, input lag, refresh rates, additional technologies such as FreeSync and GSync, and all that other good stuff. We then spent days doing research, poring through forums, reviews, and manufacturer websites, and called upon our and our staff’s (considerable) knowledge bank of information to compile a list of this year’s best gaming monitors. We sincerely hope our research and findings will help you in your quest to find the best gaming monitor for you. Your needs and wishes might differ however, so do feel free to check out our entire list below. We’ve also included a handy comparison table so you can see all our recommended options at a glance. The Acer R240HY is a great looking display with a modern circular base and doesn’t really look like a monitor that’s primarily aimed at gamers, but we can assure you – it definitely gets the job done. It has a diagonal of 23.8″, and you’ll also immediately notice that the bezels of this monitor are quite narrow, which makes it especially suitable for dual or multi-monitor setups. As expected for a display in this price range, the Full HD resolution offers 1920 by 1080 pixels of viewing goodness. In terms of connectivity, the Acer R240HY supports VGA, DVI-D (with additional support for HDCP signals) and HDMI. The image quality provided by this display is definitely above average, especially in this price category. Acer has chosen a great IPS-panel which makes color reproduction quite vivid, and you also won’t have any issue looking at the display from an angle: there’s no sign of color loss at all. Another great pro of this display is the included blue-light filter, which you can use on the fly to eliminate as much blue-emitting light as possible. Blue light has been scientifically proven to reduce sleep quality, so this can definitely come in handy if you’re gaming or working up late. There’s also ComfyView technology which helps reduce screen glare and it also helps that the panel has a matte finish. Response time or input lag is also pretty good for an IPS-display, with a maximum of 4 milliseconds. This is perfect for casual gamers, although not as fast as some of the other displays. For most however, this will be a non-issue. The maximum refresh rate is 75 Hz, which is higher than the conventional 60 Hz, but the difference certainly isn’t substantial. The Acer R240HY offers an amazing amount of value in a stylish package, but there are some things worth addressing, as well. Backlight bleeding is slightly present (the phenomenon where too much light is emitted on a dark image). This is common for cheaper IPS-panels and is only noticeable in dark scenarios. Another small caveat is the lack of VESA-mounting holes. You’ll have to use the included stand and won’t be able to use custom monitor stands from the get-go. You can purchase a specific adapter bracket, however. The cost-performance ratio here is really hard to beat, and so we’ve included it as one of our picks for the best gaming monitor. The ASUS VG245H is a display that was made with both PC and console gamers in mind. The main selling point of this monitor is the fact that there are two HDMI-connections available so you can connect multiple devices without having to switch cables. This is great if you want to connect it to a PC and a PlayStation or Xbox at the same time. The resolution is Full HD, which displays a sharp image on the 24-inch monitor. Aside from the dual HDMI-inputs mentioned above, the VG245H also supports VGA but doesn’t offer connectivity for either DisplayPort or DVI, which means you’re limited to HDMI for the best possible connection. As is expected with the heavy emphasis on gaming, ASUS has chosen a regular TN-panel. The best thing about this is the very fast response time of only 1 millisecond. 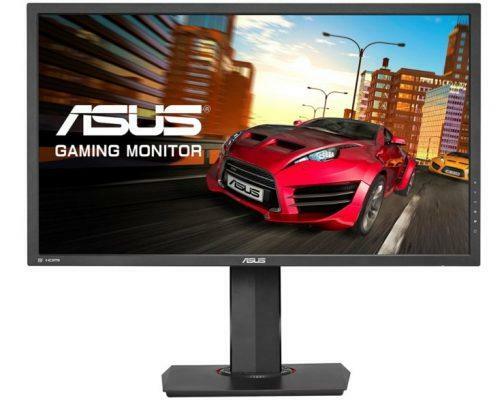 ASUS specifically targets this monitor to console gamers, so this is a major difference when comparing it to most television sets, which generally have an input lag of greater than 15ms. ASUS has also used their own proprietary technology to further improve the input lag. In terms of refresh rate the display can support up to 75 Hertz for a slightly higher than 60 FPS fluid experience. The big pro here is that the VG245H offers support for AMD FreeSync which will eliminate stuttering and tearing for a smooth gaming experience. The display also offers a great amount of versatility in terms of the stand. You can adjust the full height of the display, but you’re also able to tilt and swivel the screen to better suit the needs of your desk. And if you prefer portrait mode via pivot, that’s possible with the VG245H as well. There’s also full support for VESA-stands. The screen is exceptionally heavy, weighing in at 11.3 pounds. Although ASUS uses its GameVisual technology to boost color reproduction, it is still somewhat limited due to the use of the TN-panel. Anti-eye-fatigue solutions such as anti-flickering and a blue-light filter are present. Remarkably, this display offers a few software tricks that’s hard to find anywhere else. The VG245H can place a crosshair on top of the image for example which might give you an advantage in games. There’s also a display alignment calibration feature if you’re using multiple monitors and a built-in FPS counter. The price-performance ratio here is pretty good, which is why it made it as one of our picks for the best gaming monitor. 3D gaming has decreased in popularity the past few years in favor of higher resolution displays, but the technology still works really well and results in a very unique and enjoyable gaming experience. The Acer GN246HL is a display with full support for NVIDIA 3D Vision, which means you’ll be able to play games in three dimensions if you have a compatible NVIDIA graphics card. Even if you’re not interested in the 3D functionality of this display, the GN246HL provides a lot of great specifications for its money. The 24-inch display uses Full HD resolution like the monitors above, which is definitely reasonable for a device in this price category. You can choose between VGA, DVI, and HDMI for signal inputs. In order to maintain a fluent 3D experience, a very high refresh rate is required. Acer has used a display with a whopping 144 Hz refresh rate, which should be more than sufficient for even the most impressive graphics cards. This definitely comes in handy for extremely fluent gaming. 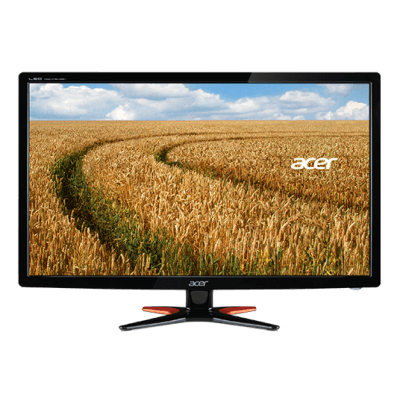 The Acer GN246HL uses a standard TN-panel and provides clear and above average image quality for this type of displays. Viewing angles, however, aren’t ideal. Acer promises to provide the best gaming experience and continues to deliver with a low input lag of only 1ms, ideal for competitive and fast-reflex gaming. 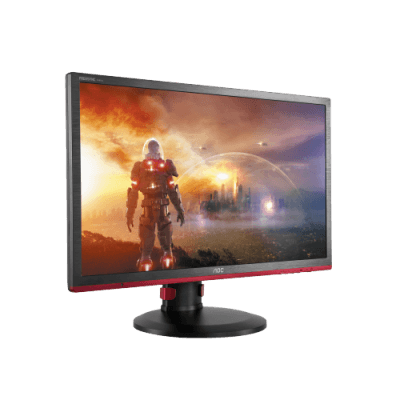 Unfortunately, the GN246HL is an older monitor and there’s no support for either FreeSync or GSync to eliminate stuttering. On the other hand, the price tag for a display this fast is certainly very attractive. An updated version of this display is available with a DisplayPort input and support for NVIDIA GSync, but that version didn’t make the list because there’s a major price difference. We also felt that there were more suitable screens currently on the market if you were searching for an affordable GSync display. At a first glance, the Philips 242G5DJEB doesn’t exactly seem like a fast and versatile gaming monitor, but looks can certainly be deceiving. This 24-inch with Full HD resolution offers connectivity options for VGA, DVI, HDMI and DisplayPort, which means you’ll be able to connect the display via every possible method. It doesn’t stop there however, because you can also connect the 242G5DJEB to compatible MHL (Mobile High-Definition Link) devices such as tablets and smartphones. On the left side of the monitor, you’ll find four USB 3.0 ports in a convenient hub. In terms of general specifications, the refresh rate is quite high at 144 Hertz which means you’ll be able to play at extremely fluent framerates if your graphics card can handle it. Unfortunately, there is no support for either FreeSync or GSync. 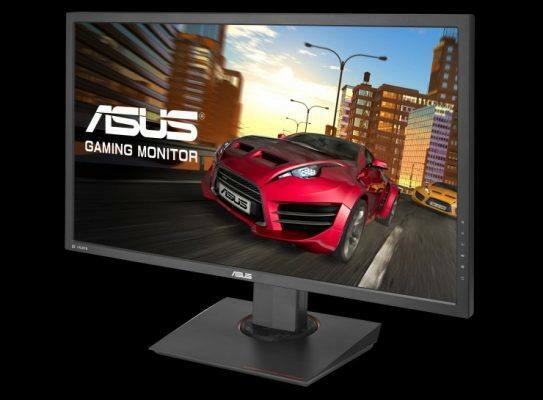 Response time is also excellent and similar to other gaming monitors at a mere 1 millisecond. Gamers with quick reflexes won’t have any input lag issues at all. The monitor uses a standard TN-panel and produces a decent image quality. The screen is best viewed directly up front and as you might expect with a TN-panel, viewing angles aren’t great. The maximum brightness of a monitor generally isn’t that exciting and unless stated otherwise, all displays in this overview have a maximum brightness of 250 candelas per square meter. This panel from Philips is a vast improvement, however, with a maximum of 350 cd/m². This can be particularly useful if you’re working in brightly lit environments. This Philips display also has a few unique features. First of all, there’s an included remote control which you can use for pre-determined settings. That means you can easily switch settings on the fly, or choose another input for example – no need to navigate using the clunky on-screen display controls. In a gaming situation, the included SmartFrame option might give you a slight edge in games. It basically highlights a certain area on the screen to make it stand out from the rest which is great if you’re looking for enemies in dark places for example. The display is also adjustable in height. 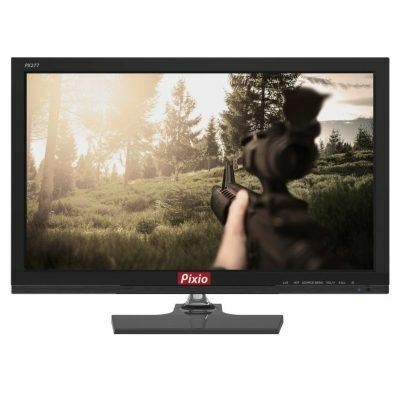 The Philips 242G5DJEB is a tad more expensive than other 144 Hz displays without FreeSync or GSync, but makes up for it thanks to the excellent brightness readings, useful remote control and tons of connectivity options. AMD’s FreeSync (also referred to as Adaptive Sync by some monitor brands) is a fantastic technology and is available on screens with a lower refresh rate. However, it truly starts to shine at higher refresh rates, and combines extreme fluidity with zero screen tearing. The AOC G2460PF ticks all the right boxes. Let’s start with the most important things. As you might expect the monitor offers full support for AMD FreeSync with a very high refresh rate of 144 Hz. If you have a capable AMD graphics card, playing at a very high framerate (above 60 FPS), it will result in a truly fluid gaming experience. The refresh rate should synchronize perfectly with the GPU, which means you won’t have any screen tearing at all. Input lag is certainly an important factor as well, and the AOC has nailed this aspect with a maximum response time of only 1ms. The monitor does use a TN-panel in order to achieve these high refresh rates and low response times, but has a better image quality than most other TN-displays. Viewing angles still aren’t great however and there’s noticeable color shifting if you’re looking at the display from a horizontal or vertical angle. Connectivity-wise, the AOC G2460PF also doesn’t disappoint. You have access to VGA, DVI, HDMI and DisplayPort inputs, and the HDMI-port doubles as a MHL-connection. There are four USB-ports present, two on each side. Unfortunately, they are of the slower USB 2.0 type, but one port has been allocated more voltage so you can charge your smartphone via USB faster. The AOC G2460PF also stands out because of its full swivel, tilt and pivot abilities. You can flip the display into portrait mode and it’s also adjustable in height. In terms of unique features, the AOC does use its own flicker-free technology (in addition to FreeSync), which should help reduce eye fatigue. We’ve got to admit: the phrases “affordable” and “GSync support” generally don’t fit in the same sentence, but the Acer Predator XB241H is one of the best budget GSync monitors on the market that fully supports NVIDIA’s anti-stuttering solution. The display itself is similar to other high-end 1080p Full HD displays. We’re talking about a higher end TN-panel with a high refresh rate of 144 Hz (which is even overclock-able to a whopping 180 Hz) and a very low response time of 1 millisecond. In other words, this Predator display is fluent and fast. Image quality isn’t spectacular due to the use of the TN-panel, but is still above average. The same can be said for the viewing angles on this monitor. There a connector for both HDMI and DisplayPort, VGA, and DVI are being left out. The design of the XB241H is somewhat aggressive and the red-orange design may not appeal to everyone, but it’s quite versatile because it’s easily adjustable in height and can swivel and tilt. Using the portrait-mode isn’t an issue at all. Another great feature this monitor has is support for NVIDIA 3D Vision 2. Gaming in three dimensions certainly is a unique experience and coupled with a fast NVIDIA GPU and a 3D Starter Kit – you’re in for a treat. Acer provides a longer three-year warranty period on its high-end Predator displays. As one of the few affordable options for a GSync-supported monitor, the Acer Predator XB241H makes it as one of our picks for the best gaming monitor. We have to admit, with a diagonal of 25 inches, this Acer G257HU technically doesn’t fit in this category of 24 inch monitors, but the size difference is marginal at best, and the screen itself offers quite an impressive amount of specifications for a modest price tag. Plus, the monitor supports all current digital connections: DVI, HDMI and DisplayPort. 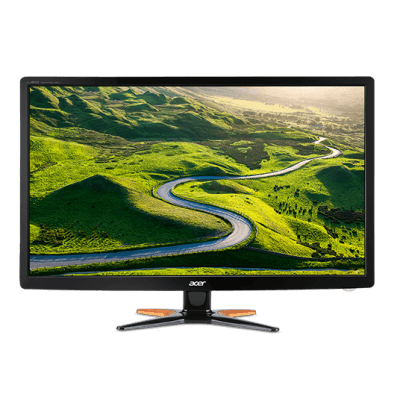 One of the main pros of this display compared to most other 24 inch gaming monitors is the higher resolution of 2560 x 1440 pixels, also referred to as QHD or 1440p. This is a noticeable step-up from Full HD, and has over 1,5 million extra pixels. This results in a sharper image and generally ensures a better image quality in games. Do keep in mind however that a higher resolution also requires a beefier graphics card in order to run games properly – although you could always lower the in-game resolution to 1080p so that’s mostly a non-issue. Acer places a heavier emphasis on image quality on this display rather than a very high refresh rate or extremely low input lag. The refresh rate is limited to only 60 Hz, which is comparable to console gaming. You won’t be able to see the benefits of gaming on an even higher frame rate on the G257U, but if you’re more interested in a higher resolution, that sounds like a decent tradeoff. Input lag isn’t fantastic but still is very manageable at 4ms. Acer has used a stunning IPS-panel in this display which ensures a great image quality with a better contrast and more vivid color reproduction. Viewing angles are also great on an IPS-display such as this one. 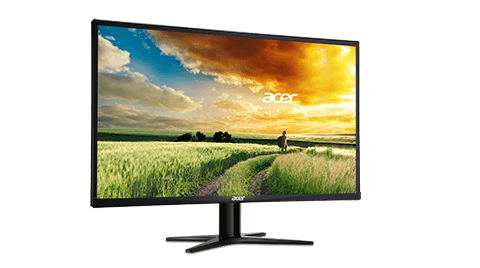 Acer doesn’t provide any additional gaming extras and the monitor also isn’t adjustable in height. There’s also no support for FreeSync or GSync. If you prefer great image quality and a noticeable higher resolution and you’re on a budget, the G257HU is hard to top. If want the absolute best possible resolution on a 24-inch display, it’s hard to ignore the ASUS MG24UQ monitor. The exact measurement is 23.6 inches, and ASUS managed to use an Ultra HD 4K-resolution (3840 x 2160), which is four times the amount of Full HD for a whopping total of more than 10 million pixels. This is also a factor 2.5 quality improvement over 1440p. If you have a graphics card (or even multiple GPU’s) that is strong enough, gaming in 4K or a higher resolution in general is a true treat for your eyes. Sharpness is excellent and image quality on this MG24UQ is superb in general. The display also has its IPS-panel to thank for that, with fantastic and vibrant colors. As expected, viewing angles are great as well. There are a bunch of connectivity options available. There are no less than three HDMI-ports: two of the HDMI 1.4 standard for non-4K devices and a fully 4K-compatible HDMI 2.0 port. You can pick the DisplayPort input instead and switching between inputs is very easy and instantly. This also makes the MG24UQ ideal if you want to use it for multiple devices. Gaming monitors are primarily aimed towards PC gamers, but the versatility of the MG24UQ also makes it ideal for use with a console or even the new PlayStation 4 Pro console, which supports 4K images. This is one of the reasons why it is our current pick for the best monitor for PS4. Because gaming at 4K and a very high refresh rate is extremely intensive, ASUS has opted for a regular 60 Hz refresh rate. It’s not as fluent as some other displays on the market, but in return you’ll get a much higher resolution. Input lag is quite decent with a response time of 4ms – the fastest you’ll get on an IPS display, but not top of the line either. The ASUS MG24UQ is fully adjustable in height and you can also tilt and swivel however you like. You can also use the display in portrait mode. ASUS also provides a blue light-filter and anti-flickering technology. The brand also is very confident and provides you with a large three-year warranty period. Despite the very impressive 4K-resolution, the most important pro of the MG24UQ is its price tag. The price difference with a 1440p display is quite minimal while the difference in resolution is huge. Futureproof is a word that’s very applicable to this display. It is worth noting however that there a number of customers who’ve received a unit with unusually large amounts of backlight bleeding, but this issue seems to be resolved. Pixio is a relatively unknown brand of computer displays and is a new contender in the market, but their PX277 screen definitely takes any doubts you might have about the newness of the brand away. The brand targets higher end, more serious gamers with its beautiful and responsive 1440p display monitors. The high resolution of 2560 x 1440 pixels is a significant improvement over Full HD. The refresh rate is excellent at 144 Hz with full support for AMD FreeSync. This offers a vastly improved gaming experience over 60 Hz in terms of fluidity. FreeSync also eliminates all forms of screen tearing when used with a compatible AMD graphics card. In terms of connectivity, this Pixio display offers you all the possible options and then some. There are two HDMI 1.4 ports, a DVI connector and both a Mini DisplayPort and DisplayPort input. Do keep in mind that in order to use the high 144 Hz refresh rate you’ll need to one of the DisplayPort inputs, as HDMI 1.4 and DVI are technically limited. A regular DisplayPort cable is included in the box. What’s even more impressive however is that the Pixio offers full support for picture-by-picture and picture-in-picture modes. With PBP, you can use two inputs at the same time and the screen will divide itself into two halves. In-picture mode allows you to overlay a secondary image source (such as a movie) on top of your main input. Pixio also has a built-in blue-light filter and anti-flickering technique which can help reduce eyestrain. Response rate (input lag) is manageable at a maximum of four milliseconds. That isn’t top of the line but is a compromise often made for IPS-displays. Nonetheless, most gamers won’t be bothered by this at all. Although backlight bleeding has been minimized to an extent, it might still be visible in darker gaming situations. At a first glance, the Pixio PX277 seems quite expensive – but the high resolution combined with FreeSync technology, great refresh rate and excellent image quality more than make up for that. BenQ has recently purchased the gaming brand Zowie and has started using the latter as a sub-brand for their gaming monitors. 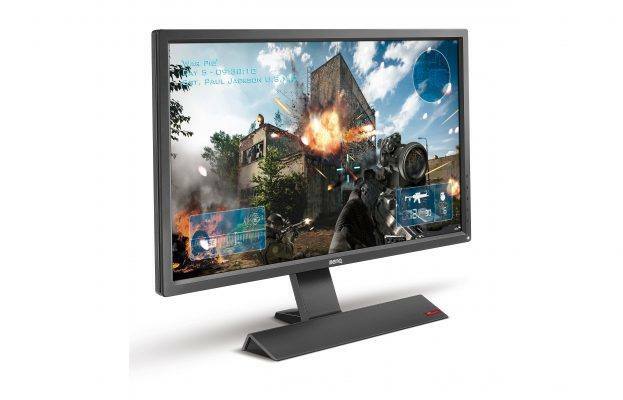 The BenQ RL2755 is a premium gaming monitor with a Full HD resolution (1080 x 1920) and fast 1ms response time. In order to achieve these impressive results, BenQ has used a more common TN-panel which is considered great for gaming but isn’t as good as some other techniques such as IPS in terms of color reproduction or viewing angles. Image quality is definitely above average as reported by reviewers and users. Connectivity isn’t an issue at all with support for VGA, DVI and dual HDMI. The refresh rate is limited at 60 Hz and unfortunately there’s no support for FreeSync. If you’re looking for a cheap 27-inch Full HD monitor with low input lag, this BenQ RL2755 is the way to go. Otherwise – you’re better off spending a little bit more for a FreeSync compatible display. The support has a blue-light filter and also supports great working anti-flickering technology. The Acer GN276HL is very similar to the Acer GN246HL we discussed in the 24-inch section and we won’t repeat every specification over here. Just like its smaller brother, the larger 27-inch version is available for a very reasonable price point and offers full support for NVIDIA 3D Vision 2.0. In short, the GN276HL is an extremely interesting and inexpensive monitor with a Full HD resolution and low 1ms response time. Check out our detailed write-up above for a full and detailed overview on the Acer GN276HL’s pros and cons. 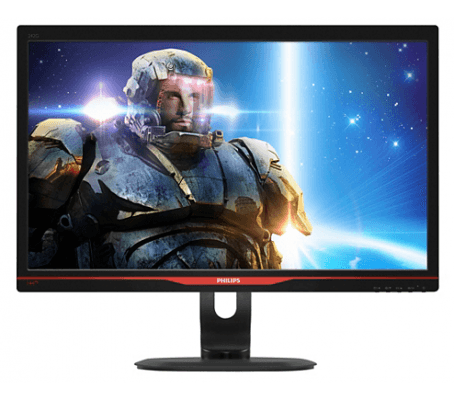 In many ways, the XL2720 by BenQ and Zowie can be considered the ultimate 1440p cheap gaming monitor. The resolution is significantly higher than Full HD and ensures a very sharp and detailed image. This monitor is also blazing fast: the refresh rate is specified at 144 Hz, and the input lag has been minimized to only 1ms, as well. BenQ has used a TN-panel in order to achieve these great results in speed and fluidity, and although that might result in mediocre viewing angles, image quality is definitely up to par with other high-end monitors. There’s support for VGA, DVI, DisplayPort 1.2 and there are also two HDMI ports available. The XL2720 is fully compatible with FreeSync which makes stuttering a complete non-issue. The display comes with a handy remote to switch presets or inputs on the fly. The screen is also height-adjustable and you can swivel it into multiple angles, but there’s no pivot mode. A neat little anecdote is that a lot of professional eSports teams prefer to use these Zowie/BenQ gaming monitors because of the excellent input lag and response time. In other words: competitive gamers have a lot of trust in these monitors which make them ideal for games where every millisecond counts. Though on the expensive side, you can’t really get it any better than this. 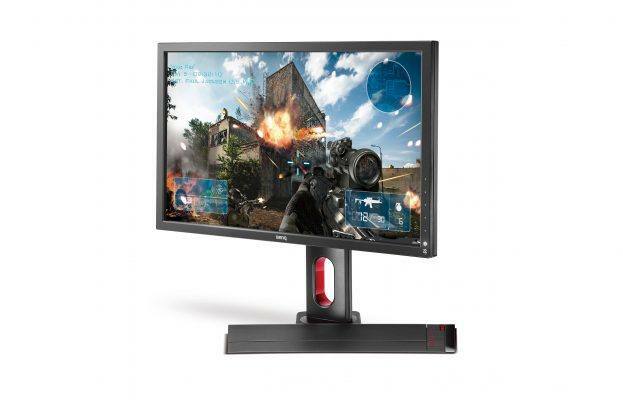 The BenQ ZOWIE XL2720 is our pick for the current best gaming monitor. You might think this monitor looks awfully familiar – it’s the larger sibling of the MG24UQ monitor we discussed above. In terms of specifications it’s identical to the latter with FreeSync, a beautifully sharp 4K resolution, fantastic image quality and a fast response time. Most gaming monitors are happy to provide support for AMD’s FreeSync, but NVIDIA’s competitive technology is expensive and therefore less popular. 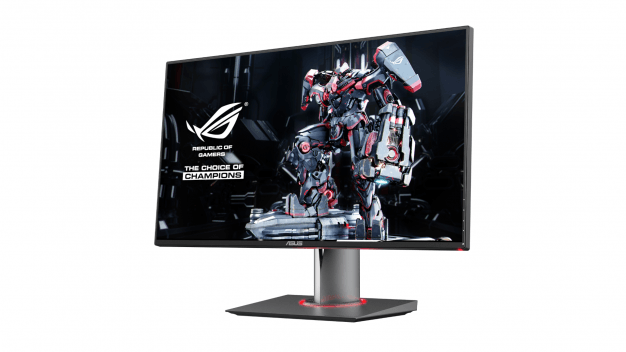 This 27 inch 1440p ROG Swift monitor from ASUS is definitely on the pricier side, but it is still one of the best screens you can buy if you’re looking for a GSync compatible monitor. Aside from the resolution and anti-stuttering technology, the PG278Q is a gaming monitor in every sense of the word. The refresh rate is very high at 144 Hz, and response time is also very minimal at 1ms. The monitor uses a high-end TN-panel with good image quality, but as expected viewing angles are rather mediocre. You can connect the display via DisplayPort or HDMI. The display also has a very premium look and feel to it with a great build quality, a mount with full support for tilt, swivel, pivot and height adjustment and a small USB 3.0 hub for two additional ports. The bezels are also quite discrete. ASUS also provided the display with some extra GamePlus software which can overlay a crosshair on top of your game. The Eye Care package also provides a blue light filter and anti-flickering methods. If you’re looking for a GSync monitor in the 27-inch range, there’s really only one display – the Swift PG278Q is the ideal choice. Before we get onto the specifics, let’s first go over some of the important general characteristics of a gaming monitor. One of the most important differences in monitors is the resolution provided. 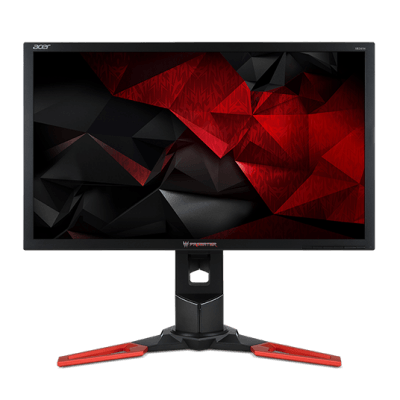 Most cheaper gaming monitors offer decent Full HD resolution (1920 by 1080 pixels), which is pretty sharp and great for casual gamers. If you’re a little more demanding however, or if you have a beefy graphics card that can handle higher resolutions, you might want to look for a sharper display, such as a 1440p (2560 x 1440 pixels) or even an Ultra HD or Quad HD (commonly referred to as 4K), which has four times the number of pixels of Full HD (3180 x 2160 pixels). The latter requires a high-end GPU to maintain decent performance, but as you might expect, the sharpness is superb, and gaming in 4K is a true joy. Another extremely important factor is the maximum refresh rate a screen can deliver. The industry standard for monitors is 60 Hz, which means that an image can refresh at the rate of sixty times per second. 60 FPS is considered to be fluent for PC gaming, but you won’t benefit from higher frame rates on a 60 Hz-display. Displays with 90 Hz, 120 Hz or even 144 Hz allow for an even smoother gaming experience. And yes, it may sound like overkill, but once you’re used to it you’ll probably never want to go back. There are two major brands of graphics cards on the market right now: AMD with their Radeon series, and NVIDIA with the GeForce GPU’s. Both offer their own technology to perfectly synchronize the delivered frame rate of the graphics card with the monitor, 1:1. This effectively eliminates all forms of frame stuttering and tearing. AMD’s technique is free to use and is called FreeSync, while NVIDIA’s GSync is proprietary which means monitor manufacturers have to pay for it. The result is identical, but if you have an AMD GPU you might want to consider a FreeSync display instead of a monitor with GSync support and vice versa. Not to be confused with the refresh rate is the maximum input lag of a display. Input lag has been improved drastically over the past few years and really isn’t a large issue any more for modern gaming monitors. Generally speaking, any display with a maximum input lag of 5 milliseconds or less is more than sufficient for most. If you’re a professional gamer, or have extremely tight reflexes it may be worth checking out displays with a 2ms or even 1ms input lag. Finally, another thing to keep in mind is the type of panel that was used. TN-panels are very common in gaming display, as they are quite fast and can easily support higher refresh rates. There are, however, other alternatives such as IPS, which offers vastly superior viewing angles and generally offers a greater color reproduction as well. Similarly, VA-panels offer the same benefits. These two panel types are great for photo/video editing and gaming because of the improved image quality. As you can see there are bunch of different displays on the market, each with their distinctive pros and cons. The two most popular size options are 24″ and 27″, and most brands release their gaming monitors in these two formats. An important decision you’ll have to make (aside from the size of the display) is whether you’ll go for a regular display, a monitor that supports AMD FreeSync, or an NVIDIA GSync display. You might have noticed that GSync displays are much more expensive that their FreeSync coounterparts. Both technologies work extremely well and there is an immense difference when compared to non-synchronized displays. The annoying part is that you’re basically bound to the brand of your graphics card. If you’re using an NVIDIA GeForce GPU, it’d be wise to invest in a GSync compatible display, and the same can be said for AMD and FreeSync. Choices for GSync displays are limited, but both models shown above are excellent gaming monitors. The three most commonly used resolutions are Full HD, 1440p and 4K. While Full HD definitely is sharp, both 1440p and 4K offer an even sharper image. If you’re a highly demanding person in terms of image quality, go with a display that supports one of the latter two. 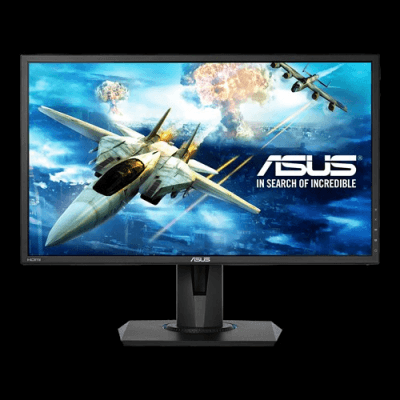 For example, the ASUS MG24UQ or MG28UQ offer 4K-resolution at an amazingly low price. We’ve discussed both TN- and IPS-panels in this overview, and it’s something you’re going to have to take into consideration. Do you prefer an extremely fast refresh rate and response time (such as the BenQ monitors), or prettier colors and better viewing angles? It’s worth noting that some displays (such as the Pixio PX277) offer both an IPS-panel and high refresh rates, so you might as well get the best of both worlds. That’s it for our overview on the best gaming monitors currently on the market. Do let us know your thoughts in the comments below and feel free to let us know which gaming monitor you’re using and what the most important factors of a monitor are for you.